Town in Moravia, about 21 miles to the north of Brünn. It has one of the oldest and most important communities in the province, though in numbers it had dwindled to 1,967 Jewish inhabitants in 1880. Even in early times there was at Boskowitz a systematically organized model school, many pupils of which became famous. 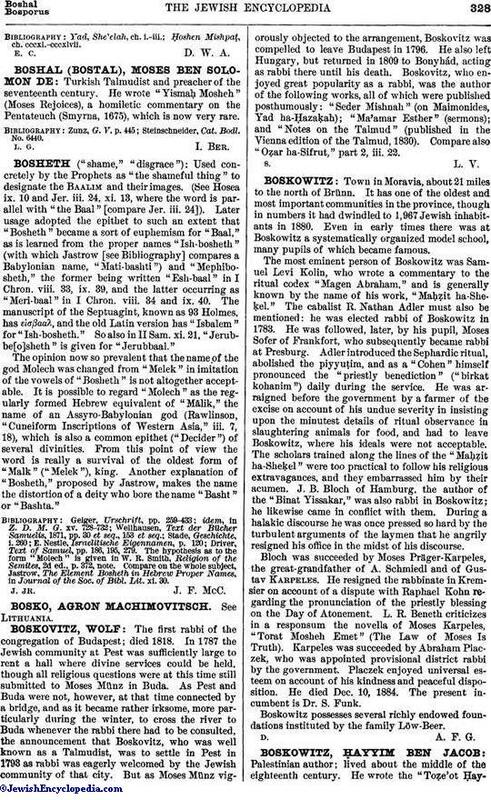 The most eminent person of Boskowitz was Samuel Levi Kolin, who wrote a commentary to the ritual codex "Magen Abraham," and is generally known by the name of his work, "Maḥẓit ha-Sheḳel." The cabalist R. Nathan Adler must also be mentioned: he was elected rabbi of Boskowitz in 1783. He was followed, later, by his pupil, Moses Sofer of Frankfort, who subsequently became rabbi at Presburg. Adler introduced the Sephardic ritual, abolished the piyyuṭim, and as a "Cohen" himself pronounced the "priestly benediction" ("birkat kohanim") daily during the service. He was arraigned before the government by a farmer of the excise on account of his undue severity in insisting upon the minutest details of ritual observance in slaughtering animals for food, and had to leave Boskowitz, where his ideals were not acceptable. The scholars trained along the lines of the "Maḥẓit ha-Sheḳel" were too practical to follow his religious extravagances, and they embarrassed him by their acumen. J. B. Bloch of Hamburg, the author of the "Binat Yissakar," was also rabbi in Boskowitz; he likewise came in conflict with them. During a halakic discourse he was once pressed so hard by the turbulent arguments of the laymen that he angrily resigned his office in the midst of his discourse. Bloch was succeeded by Moses Präger-Karpeles, the great-grandfather of A. Schmiedl and of Gustav Karpeles. He resigned the rabbinate in Kremsier on account of a dispute with Raphael Kohn regarding the pronunciation of the priestly blessing on the Day of Atonement. L. R. Beneth criticizes in a responsum the novella of Moses Karpeles, "Torat Mosheh Emet" (The Law of Moses Is Truth). Karpeles was succeeded by Abraham Placzek, who was appointed provisional district rabbi by the government. Placzek enjoyed universal esteem on account of his kindness and peaceful disposition. He died Dec. 10, 1884. The present incumbent is Dr. S. Funk. Boskowitz possesses several richly endowed foundations instituted by the family Löw-Beer.